Police in Togo have arrested three men after finding nearly two tons of ivory in a container destined for Vietnam. Two of the suspects are from Togo and the other is Vietnamese. Conservationists say the West African country is a transit point for illegal ivory between Central Africa and Asia. Despite a global ban on the ivory trade nearly a quarter of a century ago, Africa's elephant population is heading towards extinction. The numbers of forest elephants in central Africa have decreased by more than 60% over the past 10 years. 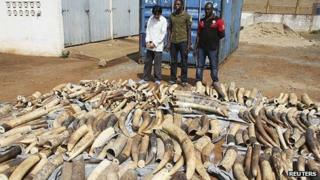 The three suspects were paraded by police before reporters along with the haul of ivory in the Togolese capital, Lome. Lt Pierre Awi said 1,680kg (3,700lb) of ivory had been concealed in a container at the city's port bound for Vietnam. "The container was loaded with wood that was serving as a cover for a large quantity of ivory in bags underneath," he said. Conservationists say the seizure represents the tusks of about 230 elephants. African countries are struggling to contain the illegal trade in ivory. On Tuesday, a court in Kenya used tough new anti-poaching laws to fine a Chinese man $230,000 (£138,000) for smuggling ivory. He was caught last week with 3.5kg of the contraband in a suitcase at Nairobi's international airport. Last August Togo announced it had arrested a man believed to be the kingpin of the country's ivory trade. Emile Edouwodzi N'bouke, who has denied any wrongdoing, has not yet been brought to trial.